Haunted houses freak me out. Even the shoddy and cheesy ones have an air about them that sets me to creeped out. I think it’s a combinations of a couple of factors. You’re in the dark in an unfamiliar location, you don’t really know your way around and the employees are there to scare the holy hell out of you, sometimes going to extremes that seem really unnecessary, to get their desired reaction. The Houses October Built takes my fears and ramps it up, making the creeps that inhabit these houses even creepier and adding a dangerous realism to the pursuit of the ultimate scare. The film, which is a mocumentary, details the quest of five friends in search of the ultimate in haunted houses (or “haunts” as they call them). Brandy, Zack, Bobby, Mike and Jeff pile into their rented RV in search of The Blue Skeleton, an urban legend that is supposed to be the scariest haunt in the entire United States. But much like a good rave, the haunt keeps changing location, staying one step ahead of everyone looking for it and only inviting those that they deem worthy to experience true horror. Along the way the group decides to visit various local haunted house in a number of different locales to get themselves ready. Everywhere they go they ask about The Blue Skeleton to varying degrees of success. Some speak of it with reverance, as if it’s a Holy land to be searched out. Other go quiet and ask the quartet to stop their quest before they get in too deep and really find what they’re looking for. Whether negative or positive their interest just keeps getting more and more piqued. As the group travels from state to state and haunt to haunt they start to notice a terrifying pattern – the haunts seem to be following them. Sometimes it’s one member of a house they visited suddenly showing up hundreds of miles from where they met them. Other times it’s a series of misunderstandings leading to near assaults and things escalating to the point of being unsafe. But the five will not give up until they find The Blue Skeleton – or it finds them. While not a perfect found footage horror film this definitely ranks right up there as a great watch. 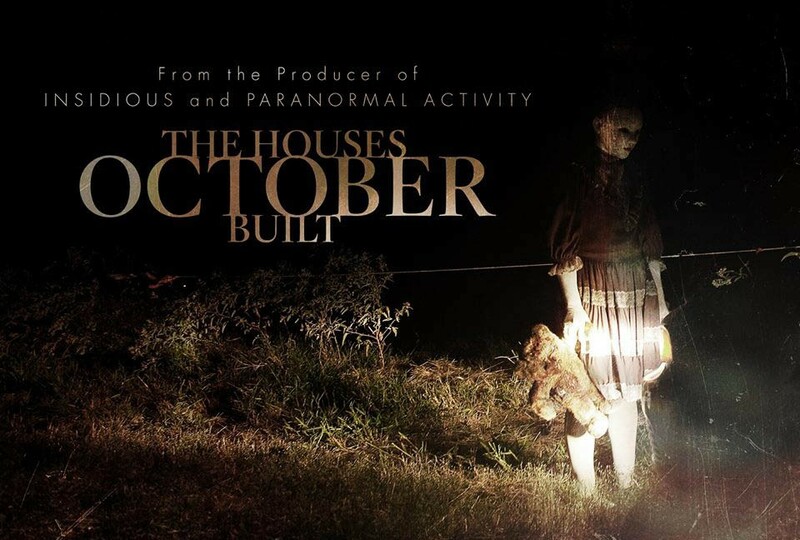 The Houses October Built starts off slow and builds to an intense and fear-filled finale, giving you few moments to really compose yourself once the group realizes that they’ve gotten in way over their heads. The film gives a real sense of violation and invasion as the group is followed from location to location and the “workers” of the various haunts get a little more up close and personal than they’d all like. The blu-ray is the way to go if you decide to watch this, as it includes a documentary on haunted houses and the like. While not as intense a scare as the feature film it is a nice little afterthought to cool down after the credits roll on the main attraction. This entry was posted in Film, Reviews and tagged IR HALLOWEEN, The Houses October Built. Bookmark the permalink.